Prepare to be choc-full of sweet treats forchocolate week (9th– 15thOctober 2017) with Tamburlaine’s sumptuous chocolate afternoon tea. Chocoholics are in for anabsolute taste sensation as they tuck into gooey triple chocolate brownies decorated with silky ganache and delicate edible flowers. Decadent dark chocolate lollipops adorned with white chocolate chips and sprinkled with icing sugar completes the eye-catching plate. For ultimate indulgence why not replace traditional loose-leaf tea with a rich, creamy, cup of hot chocolate for £3.50 before tucking into morecakes and pastry masterpieces – all freshly baked by Tamburlaine’s renowned pastry chef, Jérôme Viard. 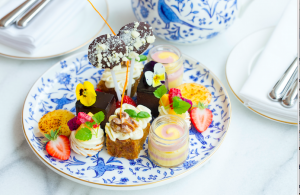 Afternoon Tea available for £21.50 per guest andis served daily between 2pm and 5pm, to book please call01223 792 888or visitwww.thetamburlaine.co.uk.